Here at On Track we have a new weapon to battle the sidelining effects of running injuries. It’s called the Alter G antigravity treadmill. 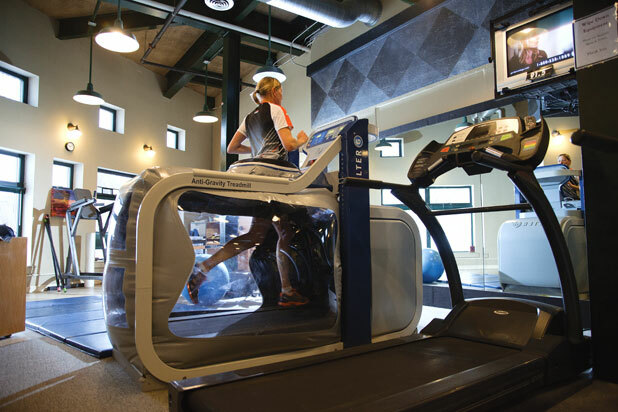 I should clarify that the benefits of this machine extend beyond injured runners. People with neurologic disorders (M.S., M.D., stroke, polio) or elderly who need the help of a cane, walker or wheelchair probably realize the most profound benefit of this machine – the ability to walk with a more normal gait, letting their arms swing freely. People recovering from knee, ankle or foot surgeries are able to walk much sooner and without pain. When a person moves without pain, they are instantly able to move using proper biomechanics which in turn facilitates healing and prevents secondary complications. By secondary complications, I mean something like ankle surgery leading to back pain. I have a patient who had ankle reconstruction surgery. After a couple weeks of walking around in the big heavy immobilization boot, they began to say that their back was hurting a lot. Their biomechanics were affected from the boot so much that their hip and back were not moving correctly. Due to the rehab protocol, they had to wear the boot for several weeks and could only limp around for short distances without it. Once I got the person on the Alter G they were immediately marveling at how they were walking normally, without pain. At first it was only while they were on the Alter G that they were walking without any pain or limp, but after a relatively short amount of time they were walking around the clinic, home and then out in public without a problem. This person also wanted to return to running. Once we were confident that the ankle had sufficient time to heal, they were running on the Alter G much sooner than they ever imagined they’d be running again. After a couple of weeks, they then progressed to running on a regular treadmill. As you can see in the picture above the person’s legs are enclosed in a large air filled chamber. The Alter G adjusts the air pressure inside the chamber and can fine tune the weight of the person using the treadmill. This is done by wearing a pair of compression shorts with a kayak-type skirt around the waist. You zip into the top of the chamber, let the machine calibrate your weight (which it doesn’t display) and you then select your body weight percentage anywhere from 100 to 20%. I can say that once you get to about 75-80% of your body weight, you really feel light on your feet! Do you think you’d benefit from using the Alter G treadmill? Please feel free to stop in to try it out! !